As you know, it is not a theory but a fact that every person on the face of planet earth can be linked to every other person in six steps or less. If you can disprove it, you’ll be up for a Pulitzer. Proximity is probably the biggest factor in how we know who we know. But with electronic social networking, we can make true connections a lot faster. We can pinpoint specific regions and industries to reach. We often forget that we are all just people. I have sent direct messages to complete strangers who may share similar interests and the responses have been surprising and wonderful. If you haven’t tried it, do so. I have connected directly with people I have been introduced to by my growing network via Twitter. I have met wonderful people all over the world - people I would never have met any other way. The naysayers dismiss sites like this as merely another chat room for people to sprout off their incoherent musings. If you follow me, perhaps that theory is strengthened? 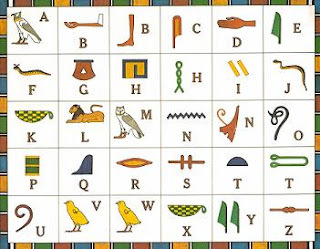 I've often wondered if hieroglyphics were ancient Egypt's version of Facebook. Jeff Pulver wrote an excellent blog post the other day about how to more efficiently network your business via social media. It’s worth the read. In 2008, I think we all need to be connectors, mavens and salesmen. I look forward to more.